This is one of those simple pieces that still manage to catch the eye of observers. The stainless steel cross is surrounded by slightly rougher material, making for an effect that is both pleasing to the touch and to the eye; though the design is simple, it's very powerful, and it isn't one that's going to be missed. People will appreciate the sense of style that goes into this kind of necklace, whether you're wearing it yourself or giving it as a gift to a friend or family member that you think it would suit. The necklace is built with a 24 inch chain and a lobster clasp for an elegant but simple way to take it on and off. 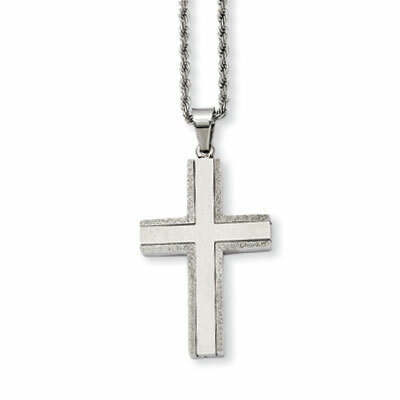 A classic piece, this stainless steel cross has laser cut edges to give it a modern feel. Cross measures 42mm (1 5/8") x 28mm (1 1/8") not including bail and comes with a 24 inch 2mm stainless steel rope chain. We guarantee our Stainless Steel Laser Cut Cross Necklace to be high quality, authentic jewelry, as described above.